Step right up and create fun cupcake favor boxes/ gift boxes! The circus tent is illustrated on all 4 sides with circus-style signs and a monkey. 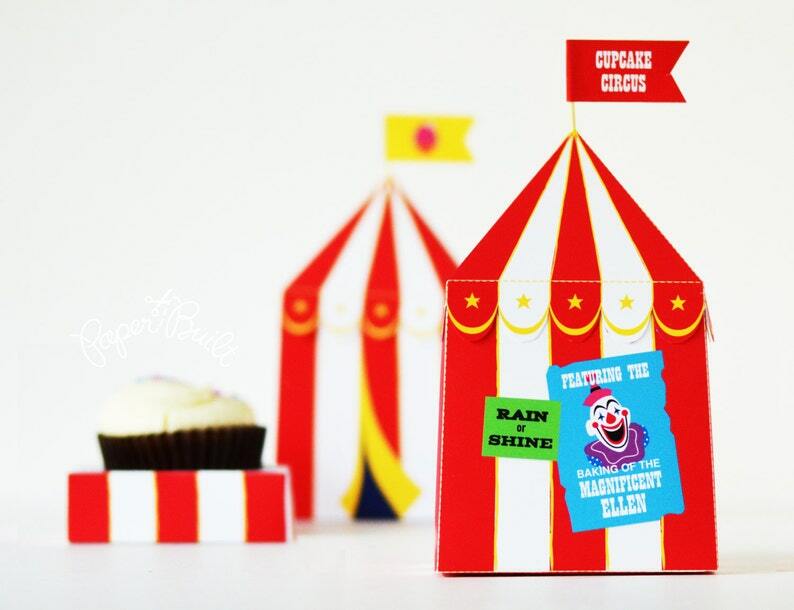 Personalize the circus tent by editing illustrated signs in Adobe Reader. The tent roof lifts off to reveal your cupcake inside. And there is a cupcake tray to keep your cupcakes looking nice. Nothing will be emailed or shipped to you! The PDF can be downloaded directly from Etsy once payment has cleared. Detailed downloading instructions can be seen below. Print as many tents as you wish for your own personal use! And make some for gifts, too! All sheets in this PDF set are formatted to 8.5x11 sheets of paper (letter size). The designs do not exceed 8"x10.5" so international customers should not have an issue printing on A4 paper. • Sign that says "The Greatest Cupcake on Earth." All (4) lines of text can be edited any way you wish in any language. * The sign has a picture of a cupcake. • Sign that says "Featuring the Baking of the Magnificent [Name]." All (4) lines of text can be edited any way you wish in any language. * The sign has a picture of a clown. • Sign that says "The Tastiest." (2) lines of text can be edited any way you wish in any language. * There are two stars on either side of "the" on the top line that will prevent long words. • (1) line of text on the cupcake tray beneath a heart. For example, it could read "Baked with love by Sarah." • Flags with (2) circus-themed fonts. * Not all characters may be available when editing the text. The text feature has only been tested with English. PLEASE NOTE: To edit the text in this package, you must have the most current version of Adobe Reader installed on your computer. You must open the Adobe Reader program first, and then open the PDF file from within the Adobe Reader program. The file will not work properly if you open the file on your smartphone or use Mac's default viewer. YOU MUST USE THE MOST CURRENT VERSION OF ADOBE READER ONLY. The circus tent measures about 3.25"x3.25" on the bottom and 3"x3" on the top. It is approximately 5" tall. The cupcake tray has a 2.25" circle hole - it fits a regular size cupcake. • 8.5x11 (letter size) heavy weight plain paper. International customers can use A4 paper. I HIGHLY recommend using matte photo paper! PLEASE NOTE: Our PDFs are password protected. You will be unable to open the file in programs like Adobe Illustrator or Photoshop, copy the elements, or change the elements. If you would like to print the file(s) at a local print center, you will need to bring the file into the print shop on a flash drive or CD, or email it to them; you will be unable to upload the file to online print centers. The files will be available for download a few minutes after your purchase is complete. Go to "Your Account" at the top right of your Etsy page. Select "Purchases and Reviews" and scroll down to your purchase. Click the blue "Download" button in the right column and save the file to your computer. It is that easy to get crafting! Simply put, I want you to use my files to create your own masterpieces. You may print the file as many times as you wish for your own personal use. Have fun with my products - even craft extras to give as gifts! This product is to be used for your own personal use and cannot be used for any commercial purposes. Please see my shop policy for more detailed terms, or contact me with questions. This product is © Paper Built. Copyright is not transferred to purchaser. All rights reserved. How long does it take to receive invitations? I have my invitations professionally printed, which can take a week. The printing timeframe starts AFTER the proof is approved. All invitations are shipped via USPS from Baltimore, Maryland. Standard shipping can take 2-5 days in the US and International shipping varies. I do offer shipping upgrades. It is a good idea to order invitations at least 2 weeks before you need to mail them out. I do send a proof, or digital sample, for all invitation orders. The proof will be sent via a convo on Etsy. As long as all party details are included in the order, I generally send a proof the morning after an order is placed, Monday through Friday. Occasionally it can take two business days for me to send a proof. Revisions are completed within 24 hours, but often the same day. Custom orders will take longer to create. Please contact me to develop a timeframe.